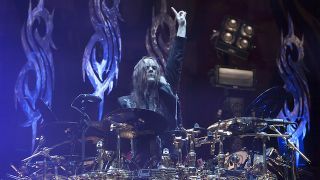 The huge breaking news today is that Joey Jordison has left Slipknot. So, to mark Joey's 18 years with the masked metallers we take a look at his finest moments at the 'Knot drum throne. They may be three albums in, but on Vol III: The Subliminal Verses, Joey shows no signs of mellowing at all. 'The Blister Exists' is a er…blistering example of his pounding drum style. We love the simple kick work at the start of the track, which quickly develops into some speedy double bass playing that interlocks perfectly with the chugging guitar riff. The mid-track breakdown also shows a stripped back element to Joey's playing as his military-style snare work makes great work of his two tub-thumping sidekicks. One of our favourite cuts from Vol 3: (The Subliminal Verses), the 'Knot's awesome follow-up to the reputation-cementing Iowa. It's syncopated rhythm runs throughout, with several 16th-note triplet fills, plenty of double kick and even the odd cymbal choke dotted here and there to keep things varied. Dig out Rhythm 155 to learn how to play this one from start to finish. A favourite among fans, critics and even Joey himself. The masked metal master told us way back in Rhythm 136: "As far as the chops and overall feel go, I like 'Surfacing'. That's one of the songs that leads everything off. It was one of the first songs we wrote." Check out the live video above for a devastating lesson in speed, technique and power all in one sub-four minute blast of aggression. Ok hands up, this isn't a beat. And no, Joey isn't the first drummer to ever dabble in rotating/flying drum risers packed with bells and whistles. But, for pure bravery (let's remember he's spinning upside down while plying with a mask clamped around his face), he gets a thumbs up from us on this one. An I was there moment if ever there was one. Slipknot return to the UK for their first show on these shores since the tragic passing of bass player Paul Gray, many wondered what state the band would be in as they headed up 2011's Sonisphere festival at Knebworth. The sheer intensity of opener (sic) proved Slipknot still had plenty of fire in their belly. While their 2009 set at Download showed that Slipknot were one of the finest festival toppers of their generation, Sonisphere 2011 illustrated that they were also pretty much unbreakable.